The transition between summer and winter in the Mammoth Lakes resort area transforms high alpine canyons and lake shores into blazing color. 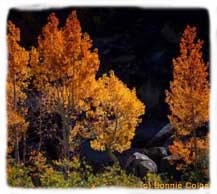 Aspens, willows, and cottonwoods unfold in brilliant hues of yellow, gold, orange and red. Light and color bathes the scenery from Rock Creek Canyon to the south of Mammoth Lakes to Conway Summit to the north. The trees generally begin their annual change in September offering the best viewing in late September and into the 2nd week of October. Plan your fall vacation as we always have fall specials in Mammoth especially for those who come up to see the trees. There are some great routes to take, including the canyon ride out to Rock Creek Lake and the Mosquito Flats Trailhead. If you go before mid October stop for some pie at the Rock Creek Lake Resort and tell 'em Jefferson says to have the boysenberry. Sue King's pies are infamous. Here's a Map to help you find the great spots. The Mt. Whitney Ranger District is peaks in many areas and you pass that on the way to Mammoth as Mt. Whitney is in Lone Pine. You can climb the Alabama hills to see into the valley. The Owens Valley trees change as well, but many of the trees do not have good color (perhaps due to the dry conditions). The areas with greatest amount of color are between 7000 and 9000 feet. Some areas to hit include Walker and Parker Canyons, Lundy Canyon and the June Lake Loop. Onion Valley and Horseshoe Meadows on the Mt. Whitney Ranger District are also good places to see. Mono Lake: US Highway 395 and State Routes 120 (Tioga Pass) and 158 (June Lake Loop) are not to be missed. Trees peak at the higher elevations. Lower elevations will peak after the higher elevations. Mammoth: US Highway 395, State Route 203 and the Lakes Basin road are all good routes. Trees change all througout Mammoth. Highway 203 is also known as Main Street and Lake Mary Road. White Mountain: US Highway 395, State Route 168 West (Bishop Creek) and the Rock Creek Road all have good colors. Many of the higher elevations peak, although the South Fork of Bishop Creek, Sabrina and Rock Creek go slower. Trees in the Owens Valley change colors, but as mentioned are simply losing their leaves rather than changing color these days. Mt. Whitney: US 395, Horseshoe Meadows and Onion Valley Roads are all pretty good. Trees change all over the District, including the Owens Valley. Viewing tips/suggestions: Storms in early October brings snow to the higher elevations and cooler temperatures to the entire region. Although a gradual warm-up occurs, temperatures will still be chilly at night and moderate during the day. Expect daytime temperatures of 40s to 50s, depending on elevation, and nighttime temperatures in the teens to low 30s. Weather can change rapidly at this time of the year; be sure to bring warm clothes with you. Dont forget to have your camera and binoculars with you for the best viewing. And dont shy away from that occasional gust of wind: it could create a beautiful sight in the middle of an Aspen grove as hundreds or thousands of multi-colored leaves flutter to the ground. Do you know why leaves change color Anne Halford, Botanist from the Bureau of Land Management explains.